Kirsten played beautifully and was so accommodating and easy to work with. She helped make our sons wedding day so special. Kirsten played the harp at our wedding & reception. She is so professional and can play anything from Canon in D to John Legend. She arrived early and the guests loved hearing her play. You & your guests will be mesmerized by having Kirsten play at your event. She is very accomplished & has played along with many celebrities yet affordable to have at your next affair. 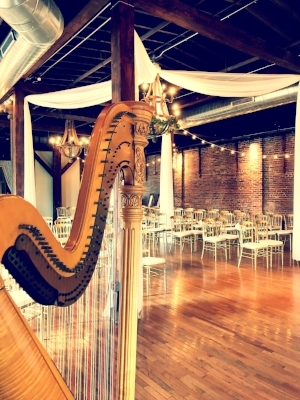 I can't wait to refer my friends who are engaged to have a harpist at their wedding. Kirsten will bring a level of class and elegance to your event. Kirsten was an absolute dream. She was always very easy to contact, super flexible with out indecisive nature, rolled with the inevitable wedding day punches, and a joy to work with. She played so beautifully and tied our wedding together perfectly. I can't recommend her enough! My experience with Kirsten in one word? Amazing! One of the absolute best vendors at our wedding - from the first contact to today (we keep in touch today!). I felt like the luckiest girl in the world when I came across Kirsten as the harpist for our wedding's ceremony and cocktail hour... especially since my husband loves Jay-Z - and Kirsten played with him! Coincidence? I think destiny! She was awesome with communication and made one of the most important (and potentially stressful) days of our lives so easy and peaceful (like her harp!). She had great advice and options for the musical selections and was open to discussing our likes/dislikes/vision of the day. She was on time, great communication, and -- AMAZING MUSIC! She sounded amazing, her harp is beautiful (as is she! ), and we got so many compliments on her music. Kirsten is the best selection you can make for your event - a true professional!